In 12-inch skillet, cook bacon over low heat 8 to 10 minutes, turning occasionally, until crisp. Drain on paper towels. Set aside. In 6-inch skillet, melt 1 tablespoon butter over medium heat. Cook onion in butter about 10 minutes, stirring frequently, until golden brown. Set aside. Between pieces of waxed paper or plastic wrap, place each chicken breast smooth side down; gently pound with flat side of a meat mallet or rolling pin until about 1/2 inch thick. Season chicken with salt and pepper. In shallow bowl, mix 3/4 cup Bisquick mix and 1/2 teaspoon chipotle powder. In another bowl, beat egg and remaining 1/2 teaspoon chipotle powder with fork. Dip chicken into egg mixture; coat with Bisquick mixture. In 12-inch nonstick skillet, heat 1/4 cup oil over medium heat. Add chicken; cook 8 to 10 minutes, turning once, until chicken is no longer pink in center and coating is golden brown. Meanwhile, in 1-quart saucepan, heat maple syrup and 2 tablespoons butter to boiling. Remove from heat; stir in bourbon. Set aside. In medium bowl, stir waffle ingredients until blended. Pour slightly less than 2/3 cup batter onto center of hot waffle iron. Close lid of waffle iron. Bake about 5 minutes or until steaming stops. Carefully remove waffle. Repeat with remaining batter, making 8 waffle sections. To assemble: Place waffle section on plate; top with 3 slices bacon, 1 piece chicken, onion slices and another waffle section. Cut each sandwich in half, serve with syrup for dipping. 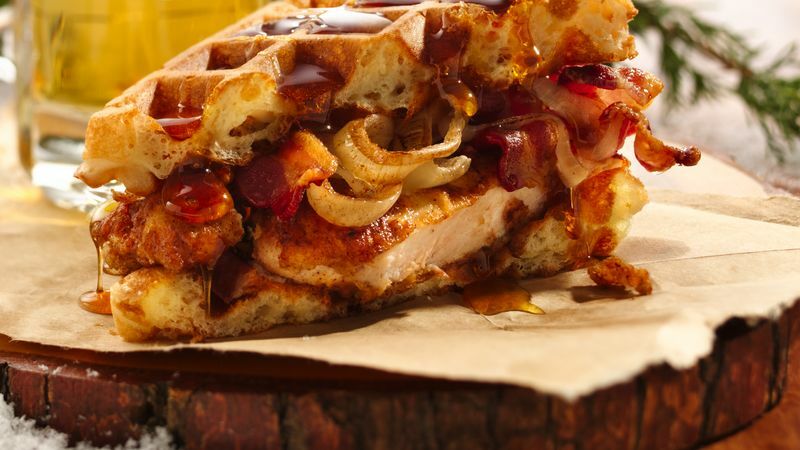 Beer aficionados may want to choose an ale or a more robust beer for these waffles. Those who prefer a milder taste should use light beer.